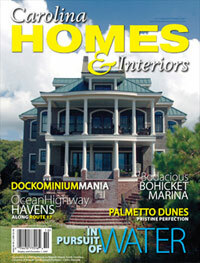 Luxury living on the waterfront will soon be a reality when Dolphin Shores, a new gated condominium community in Holden Beach, North Carolina, is completed. Dolphin Shores is expected to be move-in ready in winter 2008, but current prospects view the property by water-in a boat referred to by sales representatives as "at the office." Situated on the mainland side of the Intracoastal Waterway, Dolphin Shores offers its residents the best of coastal living in a secure, serene and luxurious waterfront environment without breaking the bank. It offers a proposed Intracoastal Waterway pier, day-docks and a large private boat storage area accessible by all residents. Additional proposed amenities include a luxury waterfront Caribbean junior Olympic pool, a clubhouse and, for the health-conscious, a lap pool and state-of-the-art fitness center. Pre-construction pricing on three-bedroom, three-bath condos starts at $399,900. Each spacious 1,728-square-foot unit offers luxury details and features an open kitchen and living area, top-of- the-line appliances and granite counter tops. All the bedrooms have a full bathroom. Other features include tile floors in kitchen, baths and laundry room, six-panel interior doors, extensive molding throughout, a separate laundry room, a 180-square-foot covered porch, an elevator and two covered parking spaces with additional storage. Each unit will be wired for high-speed Internet access. Interior Designer Cathy Maready, owner of Elephant Ears Interior Design and the Lotus Company, has chosen three custom- designed styles to coordinate flooring, fixtures and other decorating details. Cathy and her talented designers offer their professional decorating services for a fee. For a limited time during the grand opening, the Dolphin Shores developer is offering thousands of dollars in incentives, including membership in the exclusive Brick Landing Yacht and Golf Club, closing costs, upgrades and the first 12 months of HOA dues paid for the buyer. 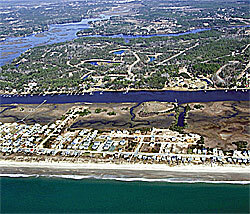 Holden Beach, with its nine miles of shoreline, is part of a chain that makes up the Brunswick Islands. Considered to be the "perfect family beach" by many, it is being discovered by more vacationers each year-many of whom decide to purchase property at Holden Beach. A 35-foot height restriction has helped ward off commercialization and guarantees that Holden Beach retains its family atmosphere. Spectacular sunsets, blue skies and finding a whole sand dollar by the water's edge make up a perfect day on Holden Beach.